Even though they mix in death metal and folk influences, Crimfall is basically another in the ever-growing line of symphonic Goth metal bands with a theatrical twist. Their new album, 'As The Path Unfolds,' is comparable to early-Nightwish, After Forever, Myriads, and even more recent bands like Forever Slave. If you're a fan of those and/or similar bands, I highly recommend checking out Crimfall. They are a talented group and their CD's feature above-average musicianship and meaningful compositions. This latest effort is no exception. My problem here, or reason for not scoring 'As The Path Unfolds' higher than a 3-out-of-5, has more to do with the whole Sym/Goth genre than with Crimfall themselves. I think Crimfall has achieved the exact sound they were looking for; but to these ears this style just throws together too many elements that just don't sound that great together. I really don't care for operatic vocals in any kind of music. But combine that with death vocals, violins, orchestral-sounding keyboards, etc. and they are accentuated even more. 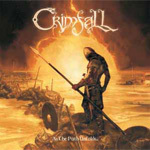 If you're really into symphonic Gothic metal or symphonic death metal then Crimfall's 'As The Path Unfolds' would certainly make a for a good purchase. If not, there probably isn't enough originality on this CD to separate them from the rest of the genre.